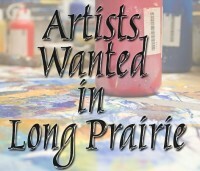 Artists Wanted In Long Prairie In July! If you're looking for something fun to do this summer, look no farther than the Long Prairie Public Library. We have three exciting art programs happening for all ages -- from school-age to adults. On Monday, July 14, 2:00 to 4:00 p.m., Lisa Arnold will teach students how to make mosaics using stained glass and ceramic tile. Each participant will create a small mosaic to take home and will also collaborate on a big community mosaic to be displayed at the library. For ages 8 to adult. Registration required, limit 25. On Tuesday, July 15, 11:00 a.m. to 12:00 noon, Abrakadoodle presents Duct Tape and Art Reloaded. Do you love duct tape? Want to learn how to make a duct tape pen? In this fun and crazy class, we'll use duct tape feathers and more to create a crazy duct tape creature pen. For grades K-4, ages 5-10. Registration required. And on Tuesday, July 22, 10:30 a.m. to 12:00 noon, learn Charcoal Drawing with Shayann Hoffer. Participants will learn basic charcoal drawing techniques including line, blending, composition, and scale, rendering from a traditional artist still life. For ages 13 to adult. Registration required. All these events take place at the library and are funded by Minnesota's Arts & Cultural Heritage Fund. For more information, or to register for any of these events, please call the library at 320-732-2332 or online at griver.org. And don't forget our Summer Storytime! We meet each Tuesday, 3:00 to 3:45 p.m. A different animal is featured each week. Stories, singing, and a craft. For ages 3 to 6.